At the south slopes of the Taunus mountains, over the touristic metropole of Ruedesheim on the Rhine, lays, within the vineyards, the traditional wine-growing town of Eibingen with its world-famous parrish and pilgrim's church of Saint Hildegard and the benedictine monastery with the same name. The history of Eibingen goes back to the year of 942 . Its fame started with the construction of the monastery in 1148. There is a document from the Archbishop Heinrich the I. of Mainz that certifies the first foundation from "Mrs. Marka of Ruedesheim". 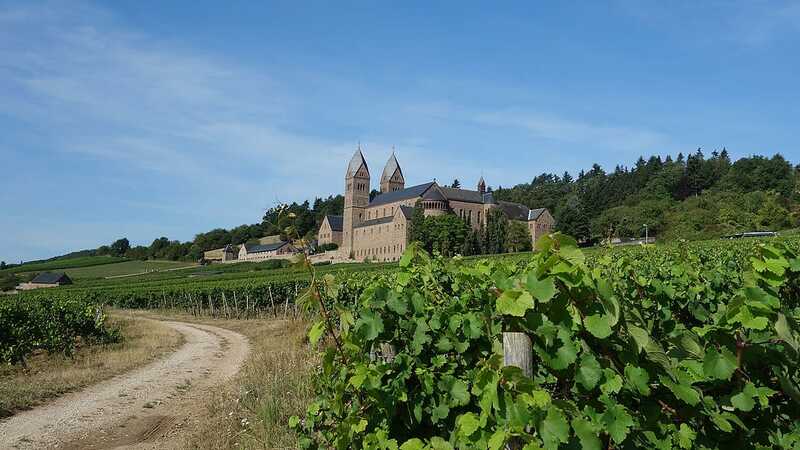 Saint Hildegard founded the monastery in 1165; it was given to the Benedictine nuns who still administer it, besides its farm and vineyards. Hildegard also founded a monastery on the other side of the river, next to the city of Bingen, namely the Monastery of Rupertsberg. This one was burned by the Swedish in 1632. The nuns fled, taking the reliquary and several manuscripts form Saint Hildegard with them; these items are still venerated by many believers in Eibingen.